Purposely built for virtualization and distributed LACP. Top-of-Rack: stackable solution for Active-Active server teaming. Aggregation and Core scalability with L3 licensing. 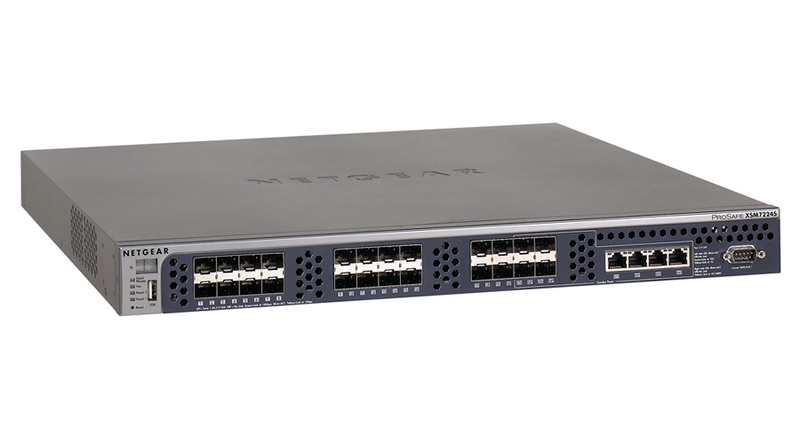 The NETGEAR ProSafe 10 Gigabit Stackable Managed Switch, XSM7224S, allows for a flexible top-of-rack infrastructure. All 24 ports of 10 Gigabit SFP+ interfaces are Gigabit/10 Gigabit capable and deliver wired speed performance with ultra low latency. Four shared 10GBase-T interfaces broaden 10 Gigabit connectivity with auto-sensing RJ45. Local/distant stacking provides versatile 10 Gigabit deployment possibilities, such as Distributed (LACP) Aggregation for virtualized servers and storage. Enterprise-class L2+ Combining superior resiliency, enterprise-class security, and non-blocking performance, the XSM7224S offers a full set of Layer 2 management features, as well as Layer 2+ (Layer 3 lite - IPv4 routing) with unsurpassed affordability. Together with VLAN routing, voice-class prioritization, and chassis-like stacking, the XSM7224S can be deployed as a data center Top-of-Rack switch, or closer to the core of small and medium businesses' growing networks, as a distribution layer 10 Gigabit Ethernet aggregation switch.